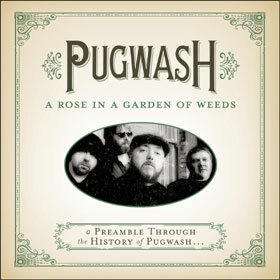 Irish band Pugwash has been around for fifteen years, and during that time, leader and songwriter Thomas Walsh has worked with a long list of people whose names will be familiar to fans of what one might call guitar pop: Andy Partridge, Dave Gregory, Ben Folds, Jason Falkner, Nelson Bragg, Michael Penn, Eric Matthews and many others. But for whatever reason, in all the years they’ve been together, Pugwash has escaped the notice of most American listeners. Walsh believes he knows why this is the case. “We never had a label on the mainland of the U.S.” Thanks to fans who happened to own record labels, Pugwash has had their best music compiled on no less than three separate best-of collections: Australian label Karmic Hit released Earworm in 2003. Ape House, the label run by ex-XTC guitarist/vocalist Andy Partridge, put together the Giddy compilation in 2009. And now, Grammy Award-winning USA-based label Omnivore Recordings has released A Rose in a Garden of Weeds, a seventeen-track survey of Pugwash’s most timeless melodies. Walsh says that early on, he and his Pugwash bandmates thought, “We could release an album in Ireland or Europe, and then people [all across the globe] would say, ‘Oh, that’s pretty good.’ But no.” That’s not how it worked in the real world. But Partridge’s love of Pugwash’s music didn’t pave the way for a proper stateside release of Giddy. “When it came to America,” Walsh recalls, “his deal with the people who were going to bring records to America wasn’t as strong as he thought it was. And it certainly wasn’t as strong as I thought it was. So it didn’t really come out there.” Walsh paints a description – kidding only slightly, one can assume – of boxes upon boxes of Giddy being unloaded on a New York loading dock, waiting for fans to come around and pick them up. And nobody ever did. “It just flopped,” Walsh says.